Competition is fierce everywhere and networking is a critical factor in developing relationships that can lead to new customers. Today the emphasis may be on social media networking, but don’t ignore the value of face-to-face networking events. The personal relationships you develop with other Mercer County business owners help connect you to the community and help your business stand out. Increase the AWARENESS of your business. Since no one knows your products and services like you do, you should meet members of our local business community and tell (or remind) them what you are doing. You and your business become more memorable when you interact in person with another B2B owner. Discover new opportunities to create SUPPORT networks. We often want to help one another succeed. When we take time to meet people and find out about their business needs, we build relationships and develop trust — an important first step to obtaining qualified referrals. Find SOLUTIONS to business problems through discussing them with peers who experienced the same challenges. Get insights on local challenges and find out how those challenges may impact your business. When you have experience with certain challenges, be sure to contribute to the solution by sharing your insights. Develop relationships with other businesses to give and receive REFERRALS. Your main goal in investing your time is to secure referrals. Your primary focus is first on building relationships through networking. Be prepared to give referrals as well as receive them. Your schedule will always be full and your to-do list never ends, but making time to attend local networking events are a MUST to help you succeed. The most valuable asset your business has is YOU. By networking at local events you are raising awareness of your business in the community, building loyalty and support, finding solutions to business challenges and ultimately bringing you referrals for new business. 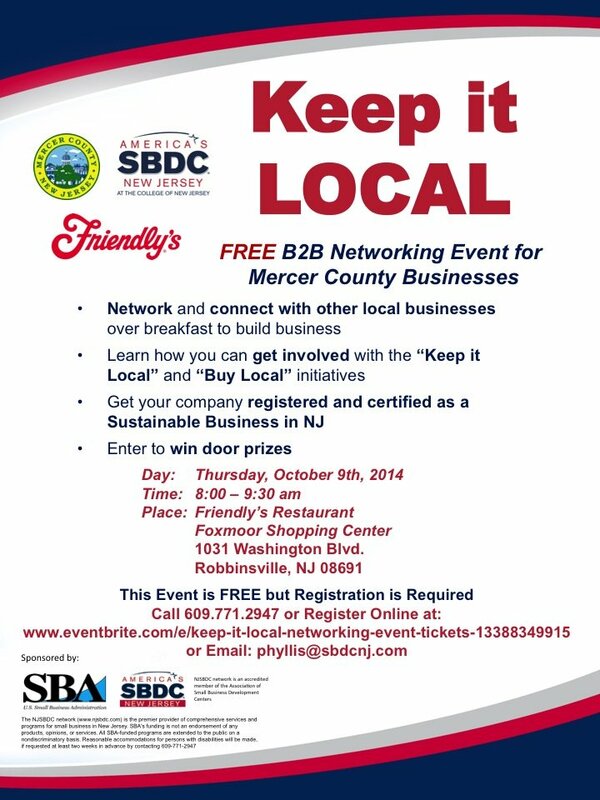 On Thursday, October 9th, America’s Small Business Development Center supported by The Mercer County Office of Economic Development and Sustainability invites you to attend our Keep It Local networking event at Friendly’s in Robbinsville. Bonus: Friendly’s is kicking off their new 1/2 price breakfast promotion – YUM! Don’t miss this opportunity to meet and connect with other Mercer County Businesses. Register today and tell a friend!